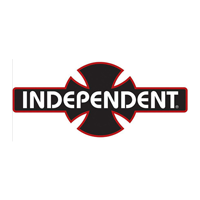 Independent Truck Co. was founded in 1978 in Santa Cruz California. They produced their first truck, the Stage 1, as an alternative to the trucks on the skateboard market at the time which were of a poorer standard and did not meet the demands of the skate world which was fast developing. Since then Independent have made a name for themselves as the king of skateboard trucks and continue to produce market leading products. Independent have a ridiculously big skateboarding team which consists of names such as Geoff Rowley, Andrew Reynolds, Anthony Van Engelen, Brian Anderson, Chris Haslam, Daan Van Der Linden, Grant Taylor & John Cardiel. In 2013, it was announced that Tony Hawk had joined the Independent skate team. If you're after the best skate truck on the market then Independent is the truck for you!